Good news, Planeswalker! We're headed back to check in on the guilds of Ravnica in the latest Magic set, appropriately titled Guilds of Ravnica. Five of the ten guilds are featured here: Dimir, Izzet, Golgari, Boros, and Selesnya. If you're a fan of the other five, fret not. There are plenty of goodies in all five colors in this set, and I have it on good authority that we may not be leaving Ravnica for a while. What's up with the guilds these days? Tension, mostly. A cold unease grips the populace. Guild leaders are turning up dead or missing. Everyone senses something big is coming. No one's sure what, but it's no time to let your guard down. Each guild has a signature mechanic and play style. You'll be able to update your existing guild decks, build new ones, and much more. I hope you're excited about what we've cooked up for your favorite guild in this set. And if you want to experiment with other guilds, that's cool—betrayal is all the rage this season. The Dimir maintain their power by seeing everything from the shadows. They know what's going to happen before it does, and they're quick to move if they don't like what they see. The new surveil ability gives you a look into—and some control over—the future of your draws. 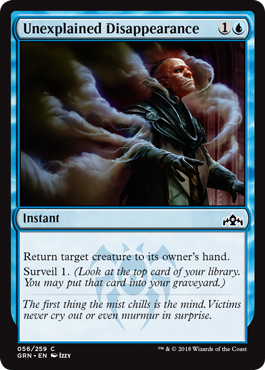 Surveil is very reminiscent of the scry ability, but don't underestimate the difference between putting cards into your graveyard and putting them on the bottom of your library. Your graveyard is a much readier resource, and plenty of cards (not to mention the abilities of some other guilds) will be quick to capitalize. If the Dimir love anything, it's advantage, so initiate surveillance on the oblivious and outmaneuver the underprepared. No guild is more responsible for building (and occasionally blowing up) Ravnica's infrastructure than the inventors and mad scientists of the Izzet. Their most recent innovation, the new ability jump-start, is based on a simple principle: if an experiment succeeds, do it again! Jump-start is found on instants and sorceries. You can cast a card with jump-start from your graveyard by paying all its regular costs and one additional cost: discarding a card from your hand. Casting a spell with jump-start follows all the normal timing rules, so sorceries with jump-start are still limited to your main phases. A spell with jump-start that was cast from your graveyard can still be countered, and if it has targets, it won't do anything if all its targets disappear or otherwise become illegal. After a spell with jump-start cast from your graveyard resolves, is countered, or leaves the stack in any way, it's exiled. Let's talk about the card you discard to enable jump-start. In the late game, this is a great thing to do with excess lands or other less valuable cards. You can also discard a different card with jump-start, setting yourself up to cast it from your graveyard later. If you end up fighting alongside the Dimir (a risky proposition . . . perfect! 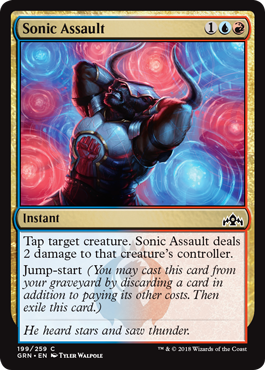 ), the surveil ability can dump cards with jump-start in your graveyard and turbocharge your options. If casting a spell once is good, casting it twice must be awesome. If the Izzet love anything, it's advantage, so get a jump-start on a dizzying array of spellcasting! Life is a circle. And the bottom part of that circle dips into the muck and mire of the dead. The Golgari have an entire plane to feed, and they know that just because something stops breathing, it doesn't mean it stops being useful. The new ability word undergrowth is used to highlight abilities that care in some way about the number of creature cards in your graveyard. Each undergrowth ability is different, so read each carefully to see exactly how all these corpses are going to help you. Golgari decks are highly interested in filling the graveyard. Creature combat is a fantastic way to do that, but discarding cards and dumping cards from the top of your library into your graveyard are just as effective. Undergrowth abilities provide scaling effects that may start small, but they can be dominating in the late game. If the Golgari love anything, it's advantage, so dig through the undergrowth and put the dead to good use. Mentor is an ability that triggers whenever the creature with mentor attacks. You choose another attacking creature with lesser power as the target. As the ability resolves, compare the powers of the two creatures again. If the target creature's power is still less than the power of the creature with mentor, put a +1/+1 counter on the target creature. If something happened in response to the mentor ability such that the target creature no longer has lesser power, the mentor ability won't do anything. 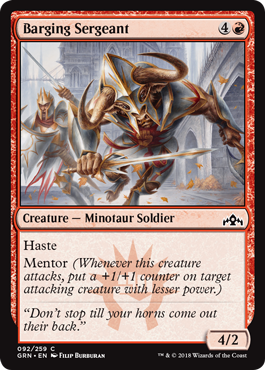 Attacking with multiple creatures with mentor may require some coordination to get all the bonuses you want, particularly in digital versions of Magic. For example, let's say you attack with Hammer Dropper, Barging Sergeant, and a 3/3 creature. 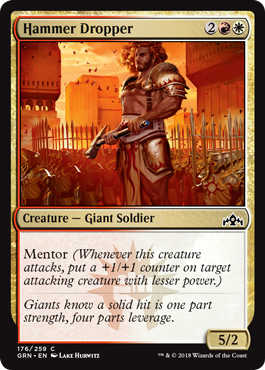 Let's say you want both mentor abilities to target the 3/3, hoping to pump it up to a hefty 5/5. Both mentor abilities trigger at the same time, so you can put them on the stack in either order. But be careful! If you put Barging Sergeant's ability on the stack first, followed by Hammer Dropper's, Hammer Dropper's ability will resolve first. The 3/3 has lesser power than the 5/2 Hammer Dropper, so your 3/3 gets promoted to a 4/4. When Barging Sergeant's mentor ability tries to resolve, it will see the target now has equal power to it. That makes the 4/4 an illegal target for the mentor ability, and that ability won't do anything. You'll be stuck with a 4/4. That's not optimal, soldier! By putting Barging Sergeant's ability on the stack second (so it resolves first), the 3/3 will pass its check first and become a 4/4. That 4/4 will then pass the check of Hammer Dropper's mentor ability, earning its second +1/+1 counter and graduating as a stellar 5/5. Well done! If the Boros love anything, it's advantage, so help those beneath you rise up and form an elite squad incapable of failure. Convoke allows you to tap your creatures rather than pay for some or all of the mana normally required to cast the spell. Each creature pays for one mana of its color or for one generic mana if it doesn't match any the spell's colors. If you tap a multicolored creature, you can choose which cost it's covering. Some things to remember: Tapping a creature for convoke doesn't involve the T symbol, so you can tap creatures with "summoning sickness," basically ones that just came under your control this turn. Tapping the creatures for convoke happens after you're done activating mana abilities. 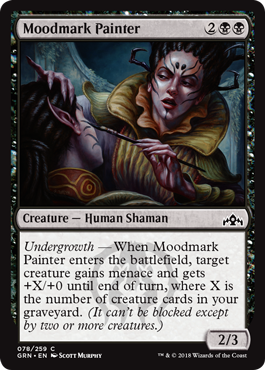 This means if you tap a creature for mana, it will be tapped when it comes time to convoke. Essentially, it can't count twice. Also, using convoke doesn't change a spell's mana cost or converted mana cost. Rosemane Centaur has a converted mana cost of 5 no matter how much mana you actually paid. Convoke is a fantastic way to deploy oversized creatures way ahead of schedule. If the Selesnya love anything, it's trees. And well-tended gardens. Go figure. These guild-based split cards include a hybrid multicolored half and a traditional multicolored half. We interrupt this section for a quick refresher on hybrid mana. A hybrid mana symbol can be paid by one of its two component colors. For example, a cost of b/g (as seen on Status, above) can be paid by either B or G. A spell with a hybrid mana symbol on its mana cost is both of that symbol's colors. Status is a black and green spell, no matter what mana you use to cast it. Hybrid mana gives you great flexibility when considering what cards to include in your deck. And now, back to split cards. And those are the new and returning keyword and mechanics included in the Guilds of Ravnica set. There's a whole lot more to discover though. Have a blast at the Prerelease, and keep an eye on this site for all the latest news, strategy, and info. May your guild emerge victorious (or at least not get totally destroyed)!